This year for Halloween my family is going to be the Mad Hatter, the Queen of Hearts, and Alice from Alice in Wonderland. As you know I preach recycled crafting and I made a DIY Mad Hatter Top Hat out of a cardboard box and hanger (among other things), but this time I decided to make my Queen of Hearts crown out of a recycled plastic container, specifically an old (but clean) sour cream container. I started off by cutting off the top trim and the bottom of the container. Next I cut a jagged edge at the top, using the first triangle I cut out as a pattern to cut out the rest so that they would be even. Next I glammed it up! 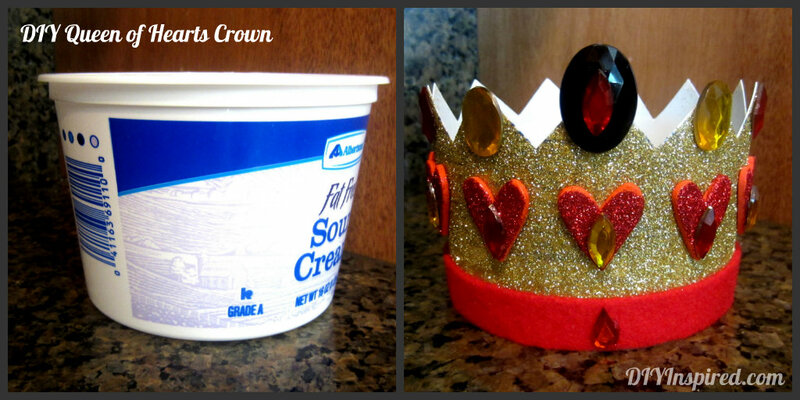 I glittered the entire crown gold and added red felt trim. I also sprayed the entire crown with a clear glaze to seal in the glitter. It helps to minimize months of glitter hair! I decided to glitter foam craft hearts in red and add plastic gems. I kept adding and adding… I couldn’t help it! Oh well, it IS a Halloween costume…it can be a little gaudy. I think these would be fun to make for a princess themed party or even an Alice in Wonderland tea party. There you have it! A low cost (or no cost) DIY crown. I love all these Alice in Wonderland costume ideas! So creative! I’m doing the Queen of Hearts for Halloween, too, and I absolutely love this idea for the crown! I’ve been looking for DIY crown ideas for awhile and yours is by far the cutest and easiest. One question though, how are you planning on keeping it on your head? Oooooo! I like the headband idea! Can’t wait to see it!!! You did an AMAZING job on it and I like it WAY better than mine! P.S. I love the headband idea! Thank you SO much Carissa! I shared it as well. Awesome post! THANK YOU THANK YOU!!! 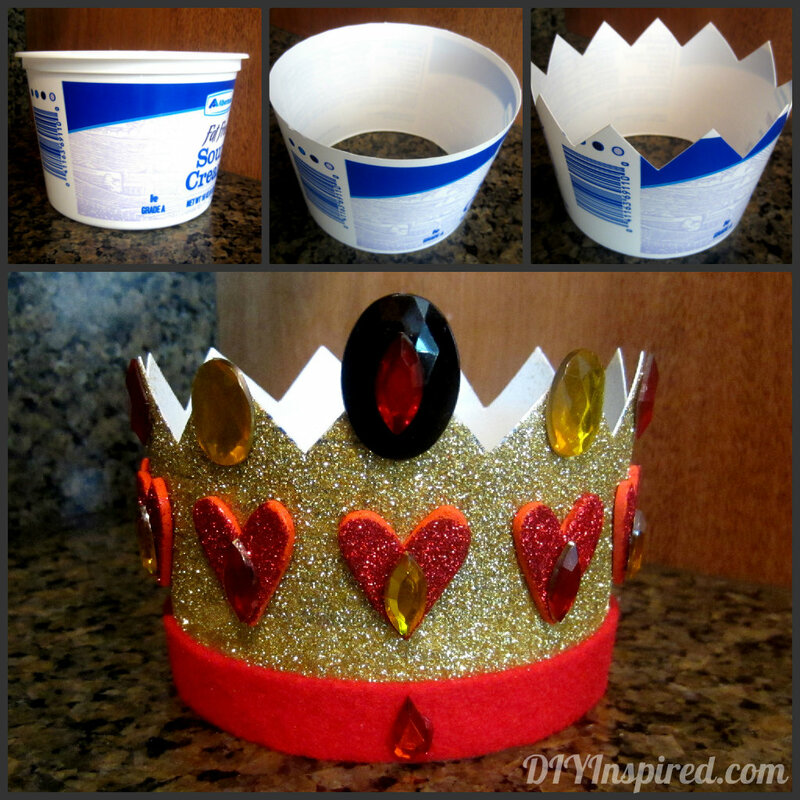 My 5 year old wants to be the Queen of Hearts and I was looking for a simple crown for her (as she probably wont keep it on)– this is perfect and turned out soooo cute!!!! Yay! You’re welcome! Glad you like it!